Fire teams block off Anapamu Street in front of the police annex building. A suspicious package that arrived at an East Anapamu Street police annex building on Tuesday and prompted an evacuation and street closure was sent by a mentally ill person living in Orange County who won’t be charged with any crimes, said police spokesperson Sgt. Riley Harwood. The package, delivered to a detective, contained an unknown liquid and a letter that referenced terrorism and poisoning, Harwood said. The detective received a similar letter from the same unidentified Tustin resident last week. The liquid turned out to be a common chemical substance and not a hazardous material, Harwood said. 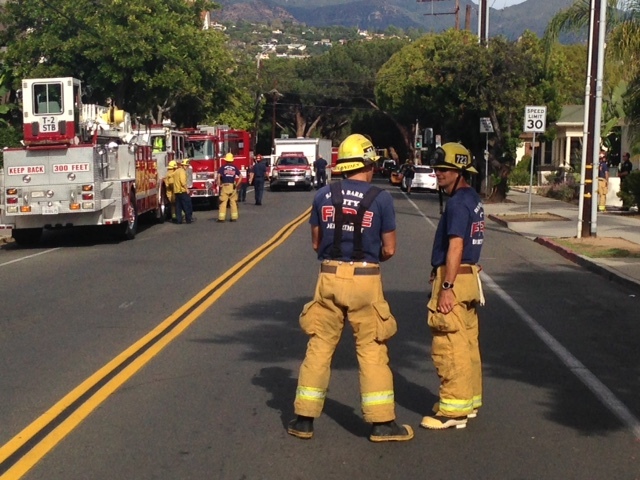 The scare prompted a large, six-hour response that scrambled a hazmat team, police personnel, and crews from the Santa Barbara, Carpinteria/Summerland, and Montecito fire departments.